1. Dig the hole deep enough for the tree roots and then knock in the post. keep your tree in its bag. 2. Spread the roots out without curling them around as in this photo. Dig the hole a bit wider if necessary. 3 . Tread down the soil firmly against the roots with your heel. 4 Put a proper tie to go around the post and tree. 5. Water the tree roots. 6. Put on a mulch mat. Not ordered your trees yet? Take a look at our varieties and availability! 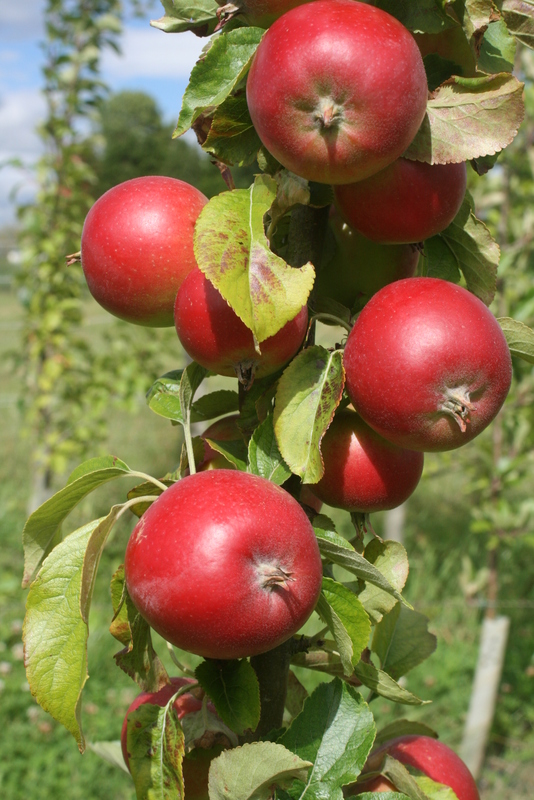 This new year, we are running ‘Fruit Tree Expert 2019‘ at Blackhaugh Community Farm – a series of workshops for the new and improving fruit tree grower. Workshops are led by Andrew Lear, who puts over 30 years of horticultural knowledge into practice by teaching and advising orchard groups and owners throughout Scotland, and propagating our heritage varieties of fruit. Each workshop is £20 per person. Numbers will be limited for practical reasons. Please reserve your place below via Paypal, or enquire at email@plantsandapples.com. Notes for participants: There will be lots of opportunities to ask questions during the workshop. We recommend bringing water and a packed lunch, or some snacks to keep you going. Facilities for making hot drinks will be available at the farm. Description: In this workshop, we will look at the theory of winter pruning followed by a trip to a local orchard for hands-on practical experience. Bring your own secateurs and loppers if you have them. Sorry, this workshop has now sold out. Why not join our mailing list to hear about our future courses? Description: In this practical and theoretical workshop, you will be able to graft and take away your own tree at the end of the session. This workshop involves the use of very sharp knives so an element of competence with them will be a pre-requisite! Description: Join us for a discussion of native edible plants, wild food and perennial vegetables, followed by a trip around the farm to forage our lunch! Description: We will learn about the wide range of fruit trees and shrubs that make up the structure of a Permaculture Garden in Scotland. We will demonstrate how to cultivate a diverse and fruitful forest garden, finishing with an exercise to design a garden at the farm with your newfound knowledge. Description: We will discuss the theory of summer pruning and training in this workshop, and draw up plans for a garden of trained fruit at the farm in the afternoon. Various methods of training, tying and protecting will be demonstrated. Description: In this workshop, we will cover the theory and practice of propagating fruit trees professionally. We will demonstrate good budding technique and you will have the opportunity to have a go yourself under field conditions at the farm. Stay in touch on Twitter, Instagram or Facebook!